The practice of “outing” homophobic politicians and celebrities was widespread in LGBTQ media in the 1990s, but later died out. A recent series of reports about U.S. Sen. Lindsey Graham’s (R-SC) sexual orientation has reignited the debate about outing. 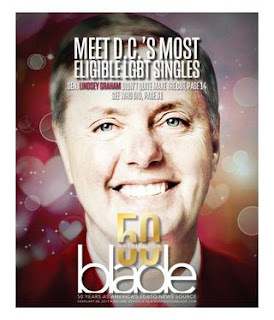 The Daily Caller website reported on a recent Washington Blade story titled “Meet D.C.’s Most Eligible LGBT Singles.” Graham’s face appeared on the cover. Sen. Graham has received a zero percent score from the Human Rights Campaign for each of his terms in office. He also opposed repeal of “Don’t Ask, Don’t Tell.” He has repeatedly denied being gay. Tammye Nash, managing editor of the Dallas Voice, has a similar viewpoint. Were we too quick to side with Jussie Smollett?